Figure 1. This 38.34 ct phenakite showed a well-defined cat’s eye when viewed with point-source illumination. Photo by Kevin Schumacher. While the beryllium silicate phenakite is known to gemologists both as a by-product inclusion in synthetic emeralds and in association with natural beryllium-containing gems such as emerald and chrysoberyl (see Fall 2003 Gem News International, pp. 226–227), it is rarely encountered in the laboratory as a fashioned gemstone. Although phenakite does occur in nature as transparent pegmatitic crystals from localities such as Brazil, and as alluvial stream-rounded Sri Lankan pebbles suitable for cutting, such gems are generally considered collector curiosities and are not often submitted to gemological laboratories for identification. Therefore, any occasion to document such a rare and unusual gem material is always of interest, especially if it also displays an optical phenomenon. We recently had the opportunity to examine a large colorless cabochon represented as phenakite that was provided for examination by Elaine Rohrbach of GemFare in Pittstown, New Jersey. This gem measured approximately 18.19 × 17.77 × 14.81 mm, weighed 38.34 ct, and was transparent to the unaided eye. Although it appeared to be essentially transparent, it also showed relatively strong chatoyancy (figure 1) in the form of a sharp eye extending across the dome of the cabochon when illuminated from above with a single light source, such as sunlight or a fiber-optic illuminator. This gem was said to be from Sri Lanka; while gem-quality Sri Lankan phenakite is known to contain “needle-like” inclusions, chatoyancy is not specifically mentioned as a phenomenon in major gemological reference books such as Robert Webster’s Gems or Joel Arem’s Color Encyclopedia of Gemstones. Numerous minute acicular tubes and platy voids were clearly seen under 30× magnification using fiber-optic illumination. These inclusions were all aligned parallel to the optic axis, which was oriented in a plane parallel to the cabochon’s base and perpendicular to the reflective chatoyant band (figure 2). Under 90× magnification, some of the iridescent platy voids displayed complex multi-component interiors. The various components showed contrasting iridescent colors, which made them stand out from their surroundings. 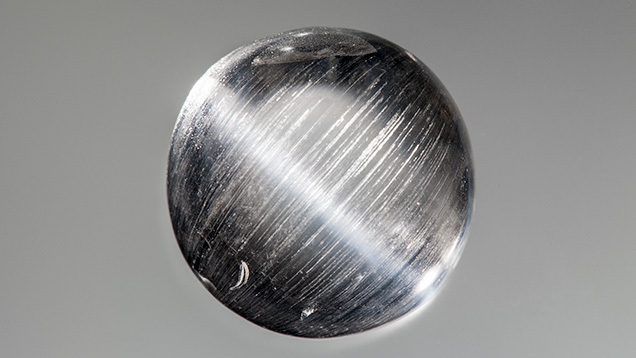 The examination demonstrated that light reflections from the numerous tubes and the iridescent voids were responsible for the pronounced chatoyancy in this phenakite cabochon. Because they were only clearly visible when illuminated from overhead, these inclusions created an interesting balance between transparency and chatoyancy that is rarely seen in gems displaying cat’s eyes. Very few phenakites have been examined by GIA, which makes this example of a chatoyant variety a very exciting experience. Figure 2. 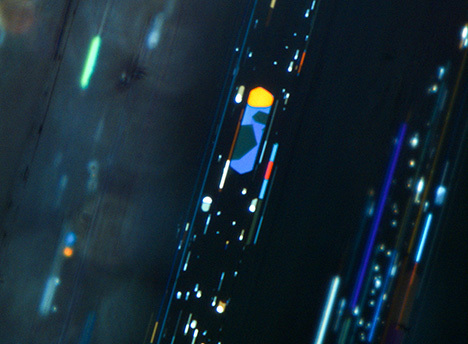 Viewed using oblique fiber-optic illumination, some of the iridescent platy voids in the phenakite contained complex multi-phase components consisting of a liquid, gas, and solid daughter crystals. Field of view 0.90 mm. Photomicrograph by John I. Koivula. It is interesting to note that another cat’s-eye phenakite was reported on in G&G’s Fall 2009 GNI section. Unlike the transparent, colorless gem reported here, that stone had a light brownish yellow color and was discovered in Madagascar. This author was reminded somewhat of the initial discovery of another gemological rarity, sapphirine, which was completely unknown to gemologists until it was identified within a short period from Australia, Kenya, Thailand, and Sri Lanka. As the world’s population grows and we search the earth’s surface for gems, more places will be more thoroughly explored and in turn new discoveries will be made. John I. Koivula is the analytical microscopist at GIA in Carlsbad, California.